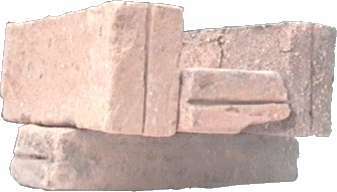 Excavation of the Cellar produced 13 whole bricks and 6 fragments. The bricks were located in the vicinity of the carved stone plinths which are believed to have served as bases for roof-support pillars. It is tempting to speculate that the bricks were used as pillars, given that their dimensions when considered alongside the dimensions of the plinth top, would allow for such a scheme. However, no firm evidence for this proposal exists and one would expect to find more fragments of bricks had this been the case. The bricks are of uniform size and are made in a shell-tempered fabric. All have a characteristic lateral groove at each end, the purpose of which is unknown.